Lymemouth is a fictional seaside town, on the West Dorset coast. It is a BR SR layout in the period of the mid 60's. In its current location it can see trains from the S&D and WR running into the terminus as well as off the SR main line. The layout has a variety of locos representing the SR, WR, LMR, Standards and the occasional Diesel. The layout itself was built during the wet summer holidays of 2009. The layout made its public debut at the CVMRC's very first exhibition on Saturday 24th October 2009 & was immensly popular, with a crowd around it all day. It's 2nd outing was the S&D Edington show in January & was again a great hit. It has since attended the Exeter Model Rail Show, Shepton's Mendip Rail 2010, & Burnham & District's Sedgemoor Rail 2010 show at Highbridge with great success. There are 5 baseboards (plus a short extension) each 4ftX2ft. A 9ft X 2ft station area, passing into a 4' X 2' countryside before disappearing into an 8' X 2' fiddle yard. The total length is 21'. The countryside area can be omitted which reduces it to 17' X 2'. The layout has a small goods yard and goods shed; turntable with a two road engine shed and servicing and refueling point; factory siding; 3 platform terminus station, with one line having a run round loop. It keeps 3 operators fully occupied with something moving at all times, which is perhaps why it is so popular with the public. Interestingly at home it becomes a U shape, having to fit into a 9' X 6' bedroom, which is quite a talking point at exhibitions. It is also wired for DCC, as well as its usual guise of DC, which allows me to use sound diesels when required. If you would like to see Lymemouth at your exhibition then please contact Dave Fosberry at cvmrc@hotmail.co.uk. 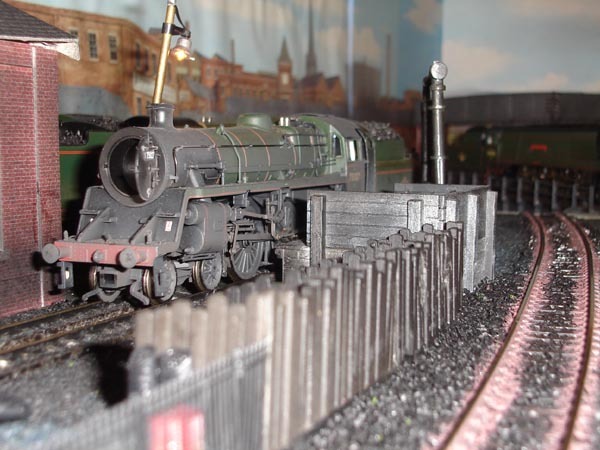 Club members operate the layout at a local exhibition.